34 worksheets match idioms. Showing best results first. If your students are interested in idioms, this lesson is perfect for your class! There are five different exercises, including a discussion at the end. How well do your students know English idioms? There is a lead-in question, followed by gap-fill exercises. Your students need to guess the meaning of the idioms and then rewrite sentences using the new expressions. The worksheet rounds off with discussion questions, so that your students can use (and personalise) the language. This worksheet is written for intermediate levels and above. There are lots of exercises to help your students memorize the idioms - and the lesson rounds off with discussion questions, so your class will have the chance to personalise the language. This worksheet is written for upper-intermediate to advanced-level learners. 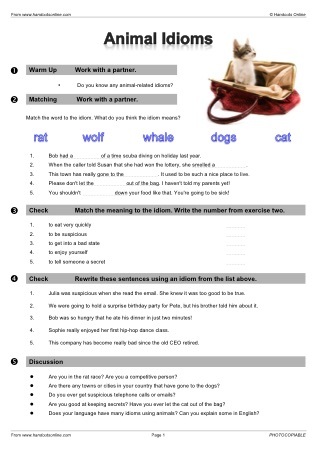 This worksheet looks at some common idioms, taking the word 'off' as the theme. The lesson rounds off with discussion questions, giving your students the chance to use the idioms in conversation. This worksheet will build your students' knowledge of some common idioms concerning money. The phrases include: 'a rip-off', 'be made of money', 'to break even' and more. There are five different exercises, including discussion at the end. This worksheet is written for intermediate-level students, but can be adjusted for other classes as well.